It is safe to say that Harriet Green, the boss of Thomas Cook, is not lacking in confidence - or the desire to take on a big challenge. Ms Green was appointed chief executive of the UK-based travel company in July 2012, after she cold-called the chairman and told him she was the right person to lead the troubled group's recovery. At that time Thomas Cook, the world's oldest travel business, was struggling with losses caused by a general fall in tourism numbers as a result of the global recession, and unrest in the Middle East hitting its package holidays to Egypt and Tunisia. The company was also saddled with debts of more than £1bn. Ms Green, 51, was convincing enough to be given the job, despite having no previous experience of working in a travel company. She says her strength of purpose can be traced back to coping with the death of her father when she was 14. "You know I lost a parent in my early teens, and for a child that is the worst that can happen," she says. "And if you can cope with that, pretty much everything else - except a very similar situation of loss - is unlikely to derail you." Ms Green, who was previously boss of electronic components distributor Premier Farnell for six years, says her first job at Thomas Cook was to boost staff confidence, and get them on side. "You need to be really working on the psychology of the business, building belief, beginning to rebuild a culture, giving people a self, a sense of renewed self-esteem," she says. Ms Green emailed all 35,000 employees, asking them to share with her "everything you think and feel about what we need to do in this company". More than 8,000 workers replied, sharing "chapter and verse" with her. And while Ms Green continued to formulate her detailed plan for the turnaround, she says she was aware that she had to calm her own go-getting, no-nonsense attitude. "Thomas Cook was quite unwell and so... I moderated my style and approach," she says. "I was much less edgy, much less aggressive. I was still very focused on time and the issues, but [at the same time] creating this environment where people could believe." However, Ms Green did show early steel when she replaced most of the previous Thomas Cook board. Ms Green said the core turnaround focus was then very simple - "managing our cash better and reducing cost". In March of this year, she unveiled her strategy. The company intends to save £350m by 2015, largely through cutting the number of its physical stores, and focusing instead on internet sales. At the same time, non-core parts of the business will be sold. More than 2,500 jobs are going, and 199 shops out of 1,069 in the UK are shutting. Transport union TSSA, which represents many Thomas Cook staff, was angry at the job losses, but says they were the result of "the over expansion and bad decisions" of Thomas Cook's previous regime. In May the company completed a £1.6bn capital refinancing, which helped to halve its net debt. Then in August it announced that its nine-month losses had fallen to £470m from £667m a year earlier. Meanwhile, on Monday, 7 October the company announced the sale of two businesses in Egypt and Lebanon. The two units in question - Thomas Cook Egypt and Thomas Cook Lebanon - offer outbound travel to Egyptian and Lebanese customers. The markets have so far welcomed Ms Green's efforts, and Thomas Cook's share price has soared. In May of last year, before she joined, the shares were trading at 21 pence each. They finished last month at 153.13p. TSSA is also hopeful that the company is now moving in the right direction. Manuel Cortes, its general secretary, says: "We believe that Thomas Cook staff are its biggest asset and that the company is now back on track. We are confident that it can once again be a successful company and a great British brand." Ms Green herself says she should be judged after five years in the job. As Ms Green continues her work at Thomas Cook, she says successful chief executives have a wide range of skills, which she terms "a rich DNA toolkit". Image caption Ms Green recently unveiled Thomas Cook's new logo, a "sunny heart"
While she highlights traits such as resilience, agility, and ability to lead speedy change, she says the most important factor is the need to be good with people, something she sees in herself. Ms Green says: "It is my experience that [chief executives] that really enjoy people - either love to develop them, or coach them or support them, or engage with their work - are much more successful than those who really are great on strategy, love the numbers, but don't really love the people aspect. "I think there is an authenticity that comes through, and if you don't love the people that you work with, that begins to show. So I think it's hard to be a successful [chief executive] if you don't really like working, developing [and] supporting other people." Ms Green adds that the DNA needed to make a good chief executive is "not gender specific". However, she does agree that more needs to be done to see more female bosses of large companies. "There are gender issues associated with why there are so few of us female [chief executives], but I think that's a different issue about role-modelling, education, the media that we can all help with," she says. Regarding the future of Thomas Cook, which traces its history back to 1841, Ms Green has eyes on East Asia. "Thomas Cook is not yet in the East, which I think is an amazing opportunity," she says. "Helping Chinese and Korean customers to explore Europe would be amazing." 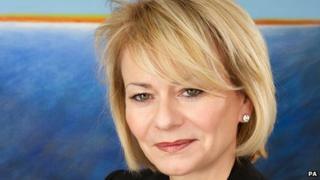 Yet despite the big plans for Thomas Cook's future, Ms Green says she won't stay forever. "I generally think [chief executives] spend far too long in the same business," she says. "I think you should... make the business great, stay around a little while to enjoy that, and then probably move on to the next thing."